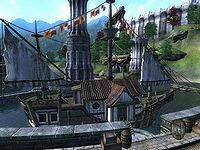 The Bloated Float Inn is an inn located in the Imperial Waterfront District on board an anchored ship. It is found at the south end of the Waterfront, close to the Imperial Trading Company building. The publican, Ormil, buys potions and food while only selling the latter. He has 50 gold and a mercantile skill of 40. All three entrances lead to the tavern deck, which in turn leads to the adjacent publican's quarters. The inn deck is below, and adjacent to it is the private room. The tavern deck contains the reception area with a counter that holds a clutter lectern, two bottles of Surilie Brothers Wine, and two bottles of Tamika's West Weald Wine. Behind the counter another bottle of each sits on top of a food cupboard, and the door next to the cupboard leads to Ormil's cabin. The stairs on the east wall lead down to a door that reveals the inn deck. The table in the northeast corner is set with an orange, a pumpkin, a tomato, and a bottle of Tamika's West Weald Wine. A non-respawning covered bowl sitting on the table holds food. The table in the northwest corner holds four blackberries, a strawberry, an orange, two bottles of ale, and a bottle of beer. The table that wraps halfway around the center post is set with an apple, a loaf of bread, a cheese wedge, and a bottle of Surilie Brothers Wine. In Ormil's cabin, his single bed lies in the northwest corner. At the foot sits a chest of drawers that contains clutter with a lectern on top with the same contents. A desk in the southwest corner also holds clutter. The stairs on the west wall lead up to a dining area, with a table that holds two carrots, an apple, a cheese wedge, and a bottle of Tamika's West Weald Wine. The wine rack in the southeast corner holds another bottle of Tamika's West Weald Wine, a bottle of Surilie Brothers Wine, and four bottles of cheap wine. A drinks cupboard in the northeast corner holds more drinks. The entrance hallway holds a clutter barrel on the center shelves on the south wall, as well as two crates and three non-respawning sacks, both containing clutter, on the shelves on the north wall. The door on the northwest leads to the private room, which is sealed until the related quest is active and contains only a single bed. The door on the southwest leads to the room available for rent, which holds a single bed and a non-respawning sack inside a clay pitcher on the table that holds random gems. The room to the east upon entering the inn deck needs a key to be opened. It holds a set of shelves on the south wall with a clutter chest, a non-respawning clutter sack, and a basket that holds a carrot and a head of lettuce. Beside the shelves sits another non-respawning clutter sack and a two barrels, one with food and one with clutter. In the north end of the room, a non-respawning grain sack sits on top of two stacked clutter crates. The barrel and cupboard nearby also contain clutter. The flags hanging from the rigging represent the symbols "1", "H" and "U" in the International Code of Signals. 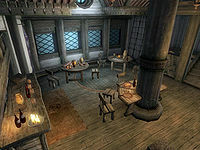 The Dark Brotherhood quest A Knife in the Dark will not occur when sleeping in The Bloated Float Inn before An Unexpected Voyage is completed. Esta página foi modificada pela última vez à(s) 16h33min de 9 de agosto de 2013.